Santa Monica is a great place to visit anytime so it was a pleasure to head south for "Surfside South" for the 18th Annual Statewide Festival. Our headquarters hotel, the Miramar, holds fond memories of a visit I made to Los Angeles during the 1932 Olympic Games. I put on the old soup and fish and danced to the music of Jan Garber and His Orchestra, then playing at the Miramar. 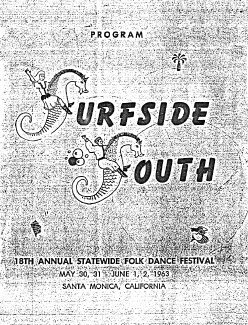 Surfside South was to be no abbreviated affair as we were to be entertained from May 30th through June 2nd. Some of us Northerners may have missed the Opening Party Thursday night, but there would be dancing Friday night, Saturday night, and Sunday afternoon, all at the Civic Auditorium. General Chairperson Liesl Barnett and her Committee made certain we kept busy. Two new presidents, Ed Feldman of the South and Carolyn Rideman of the North, were much in evidence. I remembered Ed from several Festivals back when he escorted me out to the parking lot, opened the trunk of his car, and introduced me to the first portable bar I had ever seen. It was a home-made affair he had rigged up from an old portable typewriter case. Must say it did the job! The Institute, chaired by Ralph Miller, was held in the auditorium Saturday afternoon, but the names of the teachers have been lost in the shuffle. The Sunday morning Evaluation Brunch at the Miramar was well attended with some speeches and lots of introductions. 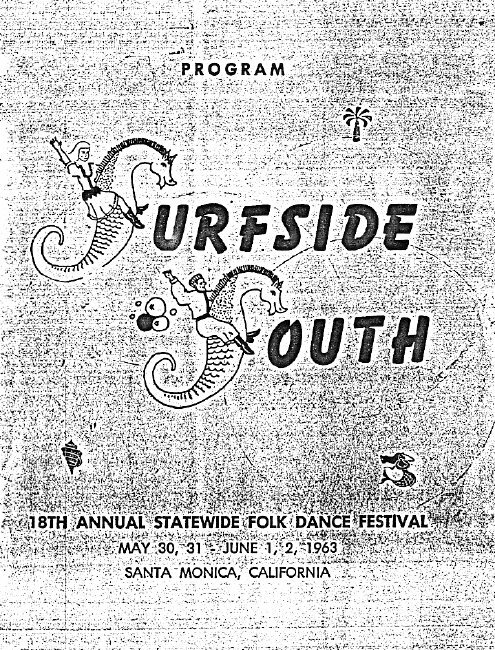 Dates for the various camps were announced, such as Idlewild, Santa Barbara, Stockton, and my Oakland Feather River Folk Dance Camp, a job I handled for eighteen years. How could I? There were sightseeing trips planned, After Parties, and Kolo Parties, some runnng until 4:00 a.m. I have probably missed something but the dancers surely didn't!